I couldn’t find the “Win10 1809 upgrade fixlet” by my bigfix console. So please tell me how to upgrade Win10 1809 inf you have a idea. Go to BigFix.me and search for “Stage1”, you’ll see the Stage1/2/3 fixlets for 1809. You can also click here. Note that your Preset should ONLY include a Messages tab entry; NO POST-ACTION. Thank you so much for your building the fixlets and all the testing you did and replying to this request as quickly as you did. 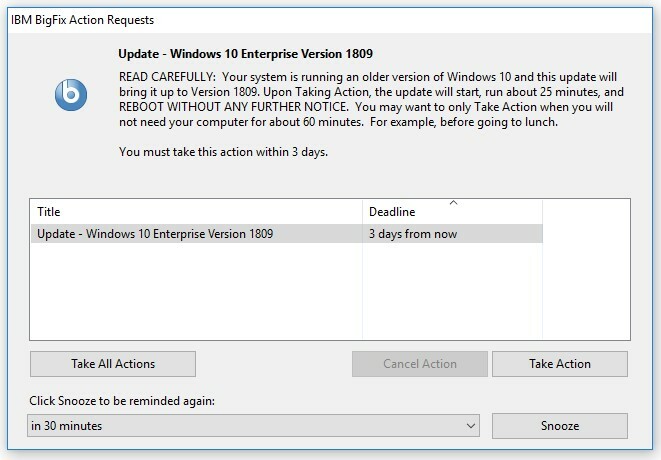 are the regular windows 10 version upgrades typically driven by user generated content, over methods supplied from the BigFix team? is there built-in functionality to support these updates typically? They’ll eventually be provided but with such a large distribution a staged process is best IMO. Sorry are we talking about these Fixlets or other Fixlets for Upgrading to Windows 10 1809? I saw those; the Enterprise one is missing (if that even makes a difference). Please tell me the way on Japanese OS because I use a Japanese OS. The name of the file isn’t so important as the SHA1 (and size). In my example, we download the ISO from our SLA account with Microsoft. The name of the file is SW_DVD9_Win_Pro_Ent_Edu_N_10_1809_64-bit_English_MLF_X21-96501.ISO and the SHA1 is the one listed in the Stage1/2/3 Fixlets I provided earlier. Regardless of which Fixlet is used, you’ll need to provide the ISO yourself and manually cache it on the BES and verify that its SHA1 (and size) matches that of the Fixlet you choose to use. thanks, that helps clarify a lot. Update… I ended up using Nirsoft’s hashmyfiles and that produced the same results as in the fixlet. Where and how do you cache the iso on the BES server? Do you just rename the iso file as the sha1 hash name and copy it to C:\Program Files (x86)\BigFix Enterprise\BES Server\wwwrootbes\bfmirror\downloads\sha1 ? That’s exactly it. Rename the whole ISO to its hash (make sure its correct) and copy to the location you provided. Thank you so much for your quick response. Looks like it is working but getting a “Disk Limited” on the Status? Then you’re gonna need a bigger boat (err…disk)! Actually that’s a common problem, the Win10 upgrade requires a lot of space – enough to download the ISO, mount the ISO, and copy the contents onto the drive during Setup. While also keeping your existing Windows installation in a Windows.Old folder. Try running Disk Cleanup, removing old user profiles, or uninstalling applications to see whether you can free enough space to install Windowds 10. I think I figured it out, running the Change tasks now. Appears to be working but how does the Stage process work? I ran the Stage1 and it completed. Does it then automatically kick off Stage 2 and then Stage 3? Or do I need to wait for the Stage 2 Relevance to turn the Fixlet from Gray to Black and then manually run it? Stage 2 and 3 should be set as Policies; Actions that never expire. Once the ISO is copied in Stage 1, Stage 2 becomes relevant and kicks off (be sure to you have your verbiage set appropriately for your environment; I had provided some examples somewhere around here).